Yay! We've had proper snow and at the weekend. The roads have been quiet but our neighbourhood gardens and park have been a hub of snowy excitement: sledging, snowball fights, snowman building, slipping on the ice and screaming (me). Young and not so young out and about having some simple fun. 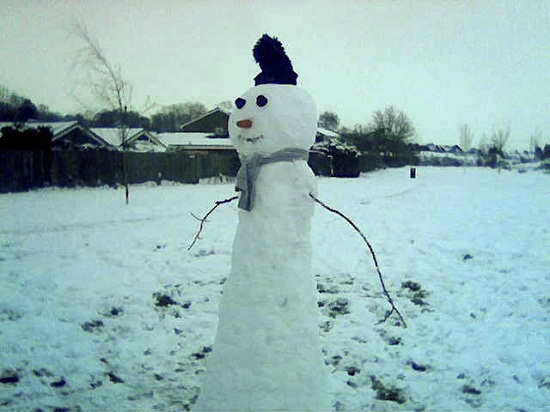 Sadly we didn't create this handsome snowman but we were asked to take a photo of him and got our chance for a photo too. Cool snowman - huh? Who wouldn't want to be his friend? We've been for plenty of snowy walks - schlepping through the snow is great exercise. Past our local park, the pool and into the city park. This little chap looked like he wished he was in warmer climes. The landscape was beautiful and couples walking through the snow added a touch of romance to the air. Everything looked magical as if we'd stepped into the wardrobe and arrived in Narnia. It is magical, isn't it. Apart from a little flurry today, we are still waiting for the snow here in the west of Scotland! love your photographs - especially th park bench and railings. Lovely snowy scenes in your photos. We had some here too. That snowman in the top photo is brilliant! I thought your celery and stilton soup recipe in your ealier post looked delicious, by the way. Thank you for such beautiful photos-we love the Snowman and the twirly bench handles. Your photos made my day! Oh how I want to scoop up that bird and bring him indoors for the night.